This is all that's on my radar. Portland's folk queen Little Sue at Biddy McGraw's, 6 PM. 21 and over. The Portland Cello Project is making their rounds on McMenamins' Great Northwest Music Tour at McMenamins Edgefield, 7 PM. 21 and over. 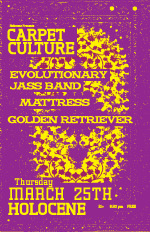 Carpet Culture at Holocene with psych-jazz from Evolutionary Jass Band, indie-electro Mattress, and Golden Retriever, 8:30 PM. 21 and over. Poppy Neon Trees at The Woods, 6 PM. 21 and over. The Portland Cello Project makes more rounds on McMenamins' Great Northwest Music Tour at McMenamins Grand Lodge, 7 PM. All ages. Electro-experimental with ASSS, Chrome Wings, Moonlandings, and Poltern at Rontoms, 9 PM. 21 and over. was elementary school this cool for you?